We get asked to recommend Taxidermy Resources by our friends, if you don't find what your looking for then please feel free to contact us. If you also wish to link to us then your taxidermy information shall only be placed in the appropriate class. Not much is known and or widely reported by this taxidermist. 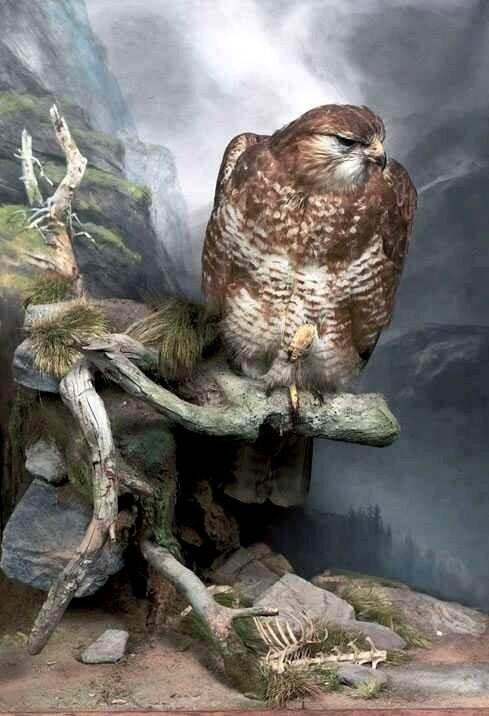 That said here are some examples of both his taxidermy and paintings. Snowbuntings by G.W. Quatremain Artist and Taxidermist. Available to purchase at auction on the 15th of August at Cuttlestones Wolverhampton Salerooms. Oh and on the subject of the Echalaz collection we will provide a significant update when we conclude our discussions with the Museusm's Association. No rush so to speak. This case made �00 on the hammer, 20% comm makes it �00 to a phone bidder. Snowbuntings by G.W. Quatremain Artist and Taxidermist. Available to purchase at auction on the 15th of August at Cuttlestones Wolverhampton Salerooms. For those who have not visited but left commission bids, here are some images. Oh and don't forget to tell your mates that you are not bidding whilst secretly bidding on line of from the car park on the mobile. Ummmmmm, bottom-feeders. Snowbuntings by G.W. Quatremain Artist and Taxidermist. Available to purchase at auction on the 15th of August at Cuttlestones Wolverhampton Salerooms. For those who have not visited but left commission bids here are some images. Oh and don't forget to tell your mates that you are not bidding whilst secretly bidding on line of from the car park on the mobile. Ummmmmm, bottom-feeders. Snowbuntings by G.W. Quatremain Artist and Taxidermist. Available to purchase at auction on the 15th of August at Cuttlestones Wolverhampton Salerooms. For those who have not visited but left commission bids. Oh and don't forget to tell your mates that you are not bidding whilst secretly bidding on line of from the car park on the mobile. Ummmmmm, bottom-feeders. Domestic dog by Quatremain of Malvern. It is understood that this person worked for Spicers. Fox stalking Ptarmigan by Quatremain of Malvern. It is understood that this person worked for Spicers. Common Buzzard by GW Quatremain of Malvern. Whilst not strictly the work of Spicer it has been suggested that he may have worked at the Spicer Yard. The quality of the work is utterly stunning. Victorian case, that has been restored to its current state. When the item was viewed for puchase the case and some of the groundwork was smashed and loose feathers were noted. Victorian label by G W Quatremain of Malvern. Victorian Kingfisher by GW Quatremain of Malvern. Very little is known about this very competent Victorian taxidermist. Victorian Water Rail by G W Quatremain of Malvern. Another stunning case from this taxidermist. 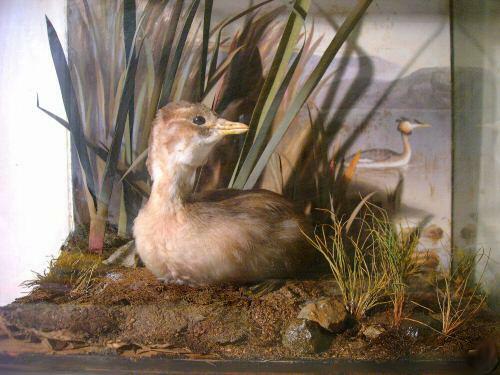 Victorian Dabchick by G W Quatremain of Malvern. Many thanks for all the images Jackie from your collection. It would appear that this case is no longer original?. 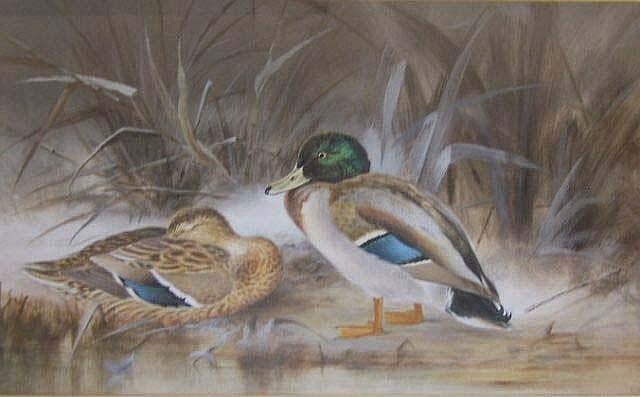 Victorian watercolour of Mallards in a winter scence by G W Quatremain of Malvern. 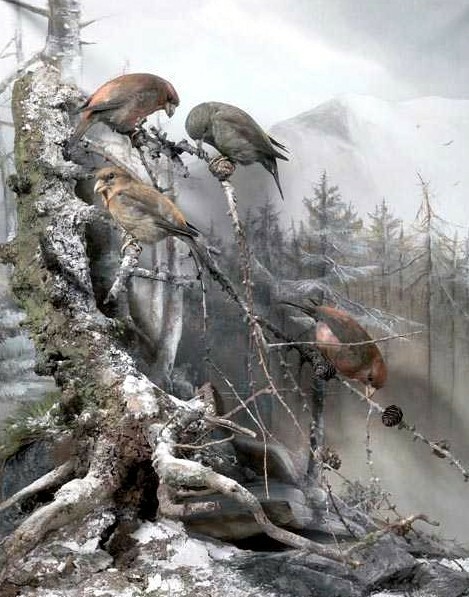 Scottish Crossbills by GW Quatremain of Malvern. Whilst not strictly the work of Spicer it has been suggested that he may have worked at the Spicer Yard. The quality of the work is utterly stunning. Victorian case,Victorian case, that has been restored to its current state. 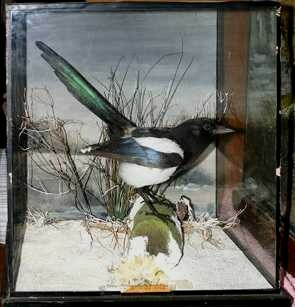 Victorian Magpie by GW Quatremain of Malvern. 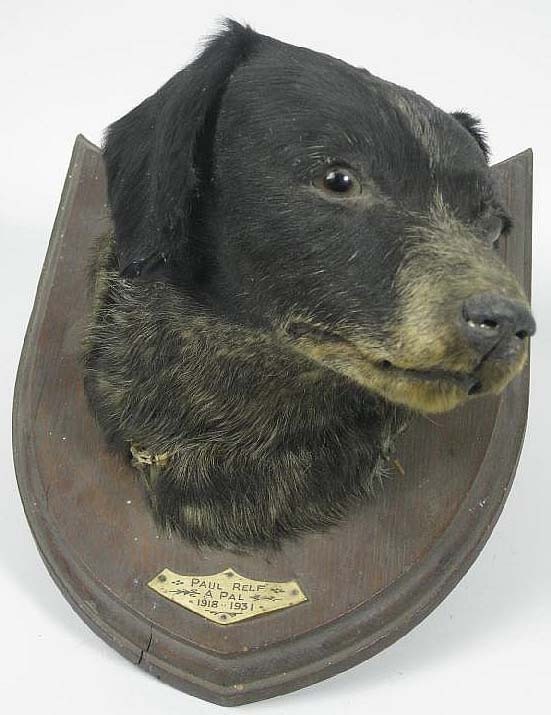 Very little is known about this very competent Victorian taxidermist. Interesting story for those who feature the image without the knowledge. Let us enlighten you. 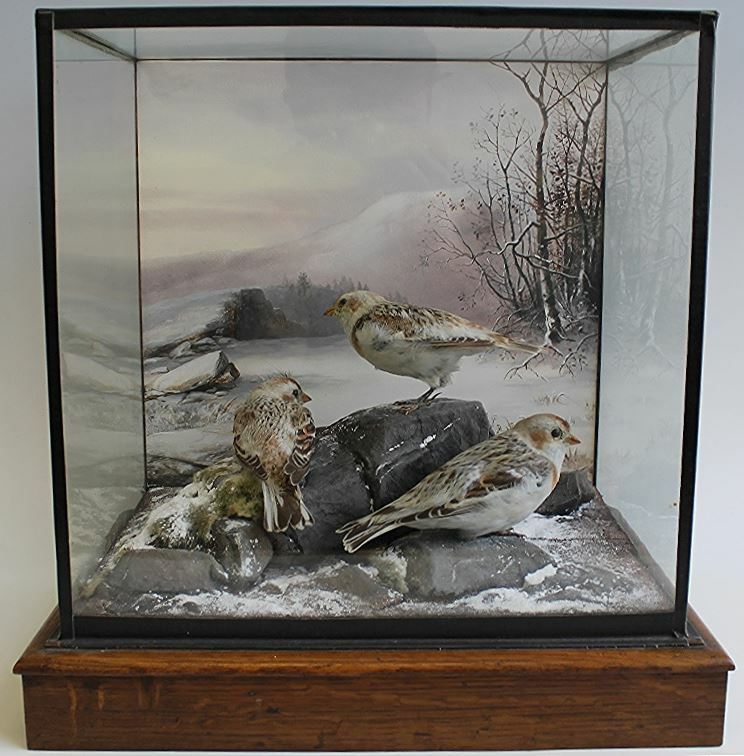 This case sold at the same time as the others, Kingfisher, Crossbills and the Buzzard by example and it made �.00. Want to know why.? 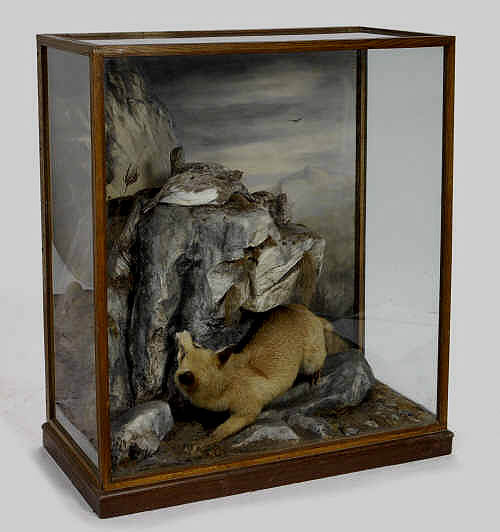 Taxidermy4Cash does not undertaken taxidermy, rather we are collectors of other people抯 work, both current and historical we also offer web hosting, a search engine submission service and increasingly one of the larger article resource banks on the net. So if your keen to learn about Taxidermy etc, then you know where to look. We are always interested to here about new resource, if you feel a resource should be listed here then please contact us.